Good Sunday to you! I’m still having trouble writing 2015 into the date consistently, but then I always do. I hope your new year’s gotten off to a good start! This recipe is one that I’m really excited to share with you – it started off as a run-of-the-mill sloppy joe recipe, but holy cow, did it turn into something more. It’s by far one of Sean’s favorites now and I think we’ll be making it many more times in the future. If you grew up in a typical American household, I’m sure many of you are familiar with the traditional sloppy joe: ground beef, a can of Manwich (to make it “sloppy”) and hamburger buns. I was never a big fan, myself. But when I found this recipe to try it from scratch and put a twist on the classic sloppy joe, I was intrigued. And when I made it for dinner and served it up, I was hooked. No joke, my boyfriend Sean and I ate these sweet and sour sloppy joes for about three nights straight and each time was as good as the last. Shockingly good for such an easy recipe. Plus, since you’re using lean ground beef, it’s not super fatty and unhealthy like the sloppy joes of your childhood, made from fresh ground chuck. It probably goes without saying, but this recipe will be making a comeback in the very near future, and it’s versatile enough you could even put it over pasta and make a version of spaghetti with meat sauce if you wanted to. Finely chop onion and add to skillet and saute for 5 minutes until tender. Add both types of beef and cook for 7 to 10 minutes until cooked through. Pour in the soy sauce, tomato paste, brown sugar, ginger, pepper and 3/4 of a cup of water. Continue to cook, stirring constantly for 4 – 5 minutes until thickened. While beef is cooking, place buns open-side up on a baking sheet under the broiler, and toast to desired doneness. Place buns on a plate and divide beef evenly between them. Serve with side dish of choice (I went with sweet potato fries this time). Can you say dinner time? 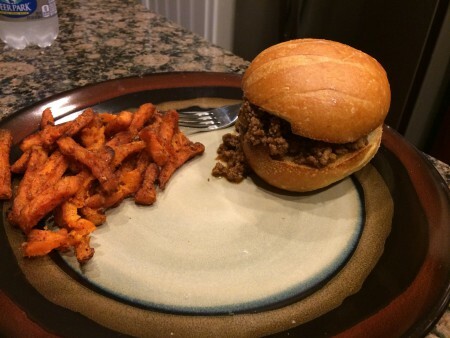 This entry was posted in Entrees, Recipes and tagged Beef, Entrees, Ground Beef, Recipes, Sandwich, Sloppy Joe, Sloppy Joes, Sweet and Sour Sloppy Joe on January 11, 2015 by Paige N..